Public health students know the famous story of John Snow’s 1854 map of London cholera cases that highlighted clustering around the Broad Street water pump. He removed the pump handle and the number of deaths dropped. (It turns out that deaths were dropping anyway and the pump handle may have had nothing to do with it, but in any case . . . ) The story demonstrates the power of visualizing data to find solutions. 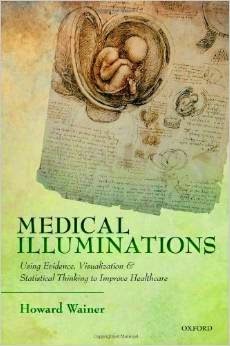 The newest addition to the CTHPP Book Club, Medical Illuminationsis an entertaining walk through dozens of health care examples of good, bad and better examples of data delivery with lessons to help make data more clear and avoid counterproductive mistakes. Issac Asimov said, “The most exciting phrase to hear in science. The one that heralds new discoveries, is not ‘Eureka’ but ‘That’s funny . . . ‘”. Constructive data analysis, editing and visualization can drive the “That’s funny” moment. This books shows us how.